This post will be my first (and quite probably only) venture into film criticism, and is the result of a bit of cajoling by our Irish correspondent Vox Hiberionacum. Expressing whether you think a given piece of film-making is good or bad springs to mind as the thing ridiculous people reach for most often when they launch into the “If you haven’t made/done an equivalent thing yourself, how can your opinion be valid?” line of argument. True, the longest bit of film I have shot is the 40 seconds or so of snow being blown in animated serpentine patterns across the taxiway at Keflavik airport (it’s pretty derivative IMHO), but when a work both owes its inspiration to an Old English place-name and includes what is almost certain to be the only line of dialogue enquiring as to the whereabouts of a place-names dictionary – prove me wrong, cinephiles! – I feel like I have some justification for passing comment. Nor are we talking about a DVD watched at home while sat on my sofa. Rather, it was a once-in-a-blue-moon screening of the 1974 TV drama film Penda’s Fen, directed by David Rudkin. And when I say screening, I mean original 16mm film reels (with a midway interlude as they were switched) and the cosy surrounds of The Horse Hospital in central London. The event had been organised to coincide with the anniversary of the death of King Penda of Mercia in AD 655. The date of 15th November is given in Bede’s Ecclesiastical History, and has far more credibility than the director’s claim that he was ‘England’s last pagan king’ (surely there were monarchs kicking around in the 680s to whom this accolade could be applied – I’m thinking one the rulers of the South Saxons or Wight, or the all-conquering, later-converted Caedwalla of Wessex). I’ll spare you the details of the film’s plot as, having had absolutely no idea of what it was about beyond the Pendan connection, I’d rather preserve some of the mystique of the work for others to discover. (You’ll gather from the photo above that Penda does put in an appearance, although in the name of academic accuracy I should stress that there’s no evidence for a direct link between the historical king and place-name.) Penda’s Fen has been shown all of two times on television – the first in a peak-time slot on BBC1 which generated what was then the largest number of complaints about a programme received by the broadcaster – and is known to have been screened only 14 times in front of an audience since then. Embarrassingly, I had no idea that the setting for the film, Pinvin i.e. “Penda’s fen”, is a real place in Worcestershire until I spoke to one of the event’s organisers at the end of the evening. Turns out the director’s wife spotted a sign to Pinvin on the way to work one day and things snowballed from there. 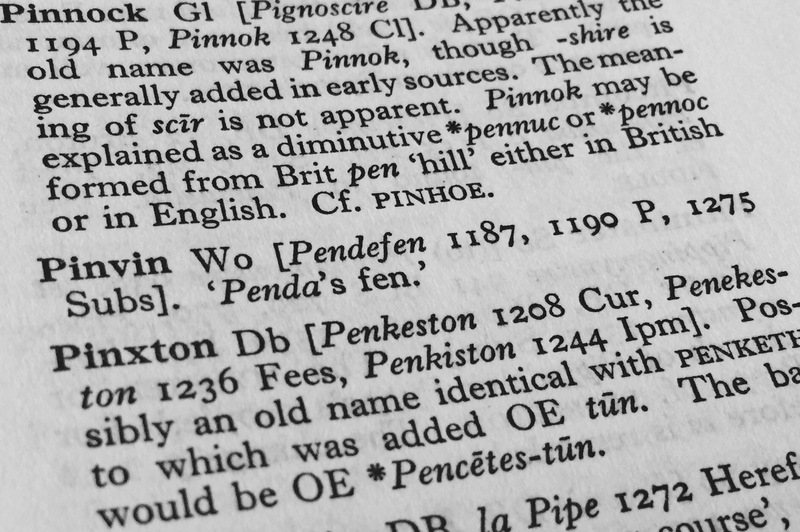 I had needlessly spent the previous 90 minutes or so marvelling at Rudkin’s credible concoction of the development of the place-name from Old English Pendanfenn > ME Pendefen > ModE Pinvin, as shown in its place-names dictionary entry (Ekwall’s Concise Dictionary, but an earlier edition to my copy to judge from its position on the page). In case anyone is interested in such things, the same shift f > v is found in a couple of Surrey minor place-names from OE fenn: Vann in Hambledon (earliest Fenne 1199), and more extremely Volvens in Abinger. You can find the entire film on YouTube, and a beautifully produced new book, The Edge Is Where The Centre Is, containing an extended interview with David Rudkin and a bunch more besides, looks still to be available to buy online. Be that as it may, if you do ever hear of a forthcoming public screening of Penda’s Fen, I urge you to make the time to go. It’s very much a work of its time but by the same token is one that hasn’t aged as much and as badly as I’m sure a lot of other dramas made around the same time have done. I’m lucky enough to live fairly centrally in London, and have done for a little over three years now. In that time (and I’m sure this isn’t an experience limited either to myself or to the UK capital), I have seen most of the rough edges of my neighbourhood smoothed and few great benefits come in its place, unless you consider another Co-op convenience store or letting agents to be worth the loss of a local pub or a continental deli which sold the best pesto I e’er did eat. Yes, this has got nothing directly to do with Surrey and nothing to do with the medieval period. And yes, I am but a part-time medievalist who counts his blessings that the rent he pays is well below market-rate for the area. Nonetheless, so much of life is underpinned by the places and spaces around us, and places like The Horse Hospital are vital if cities like London are to stay, well, interesting. Let 2015 bring with it a brighter, less money-first culture. This entry was posted in Anglo-Saxon, Art, London, Place-Names, Soapbox, TV and tagged Anglo-Saxon, BBC, cinema, David Rudkin, drama, film, History, London, Mercia, Penda's Fen, Television, The Horse Hospital. Bookmark the permalink.